Unearthly By Cynthia Hand Read-Along ~ Love.Life.Read. Krystianna from Downright Dystopian , Laura from Music Plus Books and Jenna from Rather be Reading YA, have teamed up to bring this read-along! 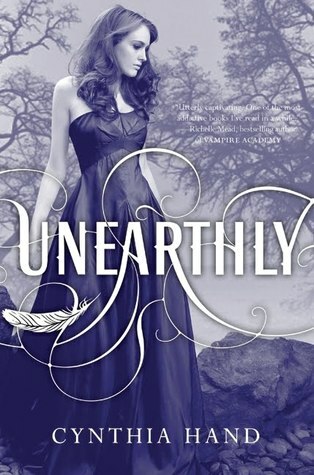 Have you reading Unearthly by Cynthia Hand yet? I have not and it has been sitting on my TBR list for quite some time so I am planning on participating in this read-along! As Clara tries to find her way in a world she no longer understands, she encounters unseen dangers and choices she never thought she'd have to make between honesty and deceit, love and duty, good and evil. When the fire from her vision finally ignites, will Clara be ready to face her destiny?Unearthly is a moving tale of love and fate, and the struggle between following the rules and following your heart. Thursday July 25: Kick Off. Read 4 chapters. Friday July 26: Read 5 chapters. Discussion posts for Day 1. Visit my blog for the Cover Remake challenge. Saturday July 27: Read 4 chapters. Discussion posts for Day 2. Visit Downright Dystopian for the Dream Cast challenge. Sunday July 28: Read 5 chapters. Discussion posts for Day 3. Visit Oops! I Read A Book Again for the Team Wars challenge. Monday July 29: Read 4 chapters. Discussion posts for Day 4. Visit Paperback Princess for the Poem challenge. Tuesday July 30: Discussion posts for Day 5. Wrap-up and review! Visit Rather Be Reading YA for the Review challenge. Go to one of the host's blogs if you are interested in joining in the fun. Thanks for signing up & helping promote us. :) Hope you're ready to start reading!